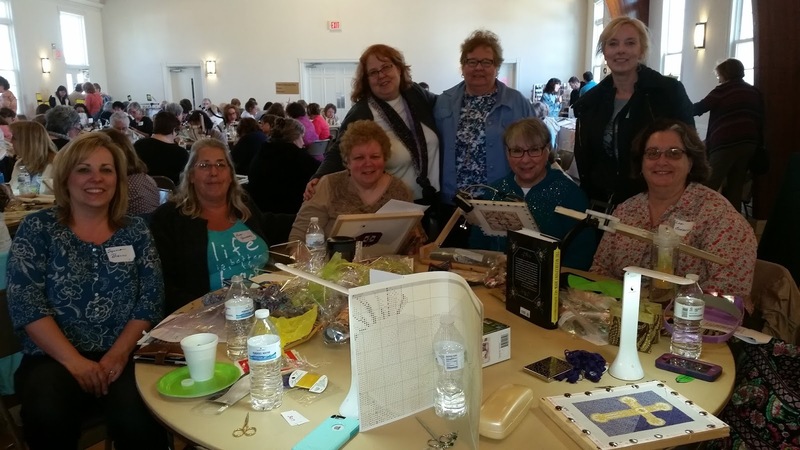 April 17, 2016--On Saturday, April 16th, I attended the 6th Annual New Jersey Needle Festival put together by Susan Hoekstra, and had a blast. This is a one day retreat type of event with lots of vendors and every type of stitching you can imagine. This is the second time I've attended and it was wonderful to catch up with friends from last year and make new ones this year. Of course, I didn't just drive up for the day (it's a long 3.5 hours away). Instead, I stayed over Friday night, enjoying a delicious dinner at the Red Oak Grill in Bedminster, NJ with many who were also attending the festival. There were lots of us stitching the beautiful ANG Stitch-of-the Month (SOTM) project designed by Susan Hoekstra and it was fun to see all the different colorways as shown in one of the photos below (courtesy of Rosi). Yeah, it's a great weekend! Great to see everyone. Glad you made the trek up north.